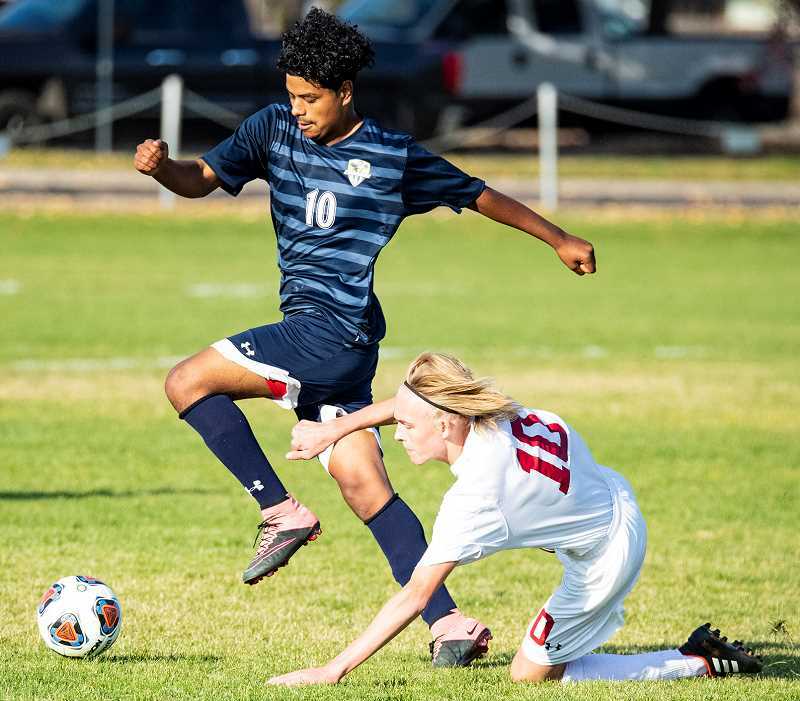 It was a tough season for the Crook County Cowboy soccer team and first-year head coach Nestor Covarrubias. The Cowboys struggled early in the season to field enough players for two teams, and it looked like they might be forced to cancel the JV season. Then as school started, more players came out for the team, and it looked like the team would have more than enough players for two teams. Then came injuries and players leaving the team. By midseason, the Cowboys were forced to cancel the JV season and at times struggled to even have enough players for practice. Still, the team hung in there, getting more competitive as the season progressed, eventually finishing with a 3-10-1 overall record and a 2-7-1 league mark, good enough to finish in fourth place in the six-team Intermountain Conference. With the roster constantly in flux, the team battled with internal issues with players yelling at each other during several games in the middle portion of the season. However, the team seemed to come together late in the season, playing their best soccer of the year, and working together much better as a team, leading to optimism about the future. The Cowboys lose five players to graduation, including all-league defender Moses Freauff, as well as defenders Mitchell Bennett, Brogyn Miller-Sampson and midfielders Jose Lorenzano and Bradley Beardsley. Also gone will be goalkeeper Pablo Casado, a foreign exchange student from Spain. Still, Crook County will have a number of returning players that should make the team stronger next season. Freshman Kevin Arroyo led the Cowboys in scoring this season, while sophomores Kevin and Jesse Sanchez also played major roles for the Cowboys, along with junior Elias Villagomez. Defender and occasional goalkeeper Abel Nunez, a sophomore, should also be a factor for the Cowboys next season, along with freshman defender Mitch Warren. However, despite having several players with varsity experience returning, it is still going to be difficult for the Cowboys to compete with the top end of the Intermountain Conference. Not only have the Cowboys had to move up from Class 4A to Class 5A, but they will have to rebuild without any players moving up from their JV program. Still, provided the team has enough players to field a team next year, they should still have more experience than the team had this season. In addition, more players are playing youth soccer in Crook County than ever before. If that translates to more players competing at the high school level, the problems that the team saw this year will hopefully slowly disappear. Still, it is going to take time before the team can compete with the top teams in the Intermountain Conference.